DUCC is one of 12 member groups currently in DOTAC. connect with others in ministries of service, justice and reconciliation. DOTAC gathers every four years. The next gathering is within our own borders, in Vancouver, BC, August 14-20, 2019. Business is carried out between meetings by a Central Committee with one representative from each member group. Registration is open. Ted Dodd currently represents DUCC on the DOTAC Central Committee and currently serves as President of DOTAC. Sharilynn Upsdell served as the DUCC representative to DOTAC for eight years from 2009-2017. DOTAC met in Winnipeg in 2002. Over 200 people gathered on the campus of the Canadian Mennonite University to explore the theme, “Reclaiming the Ministry of All God’s People.” Louise Williams, an American Lutheran Deaconess, then President of DIAKONIA World Federation gave a superb address entitled “Claiming Authority”. In the paper, she traces 5 ancient roles for the diaconate and illustrates their importance for today. It was the first time that the procedures were simultaneously translated into English, Portuguese and Spanish and that all the print materials were in these languages. It was also the first time that the Conference was organized by an ecumenical group. Presbyterian, Lutheran, Anglican and United Church people, from all across Canada, met by Conference call. A large local ecumenical volunteer core did a marvelous job of hosting and local arrangements. It was a great shot in the arm for diaconal awareness in Winnipeg. A highlight of the event was a day of site visits, allowing participants to learn about the activity of God’s people around contemporary social issues such as: immigrant farm labour, organic agriculture, First Nations Residential Schools, Refugee programs and inner city poverty. Click here for the Worship Booklet and Brochure. Linda Ervin provided important leadership for DOTAC, moving the organization into consensus decision making. 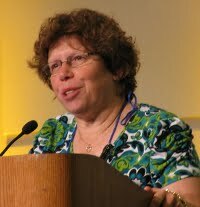 Linda Ervin was the DOTAC representative from 1996 to 2009, serving as Co-President from 2001-2005 then as DOTAC president from 2005-2009. She served as vice president of World DIAKONIA from 2001-2009. Linda reflects on her time as DOTAC President, “I used process of consensus and discernment as we made decisions. We stopped when we needed to take a break and we listened with respect for the diverse opinions around the room. We clarified our Mission Statement and objectives for the future, developed policy around DOTAC Conferences, including expanding languages we use, became a non profit in the USA and welcomed four new member groups to the DOTAC and the World table.” Click her for more reflection on that experience. The DOTAC Overcoming Violence Experience (DOVE) program is designed to build an international team that will participate in a multicultural, hands-on, action-reflection experience, related to overcoming violence in the world. A program was held in 2007 in New York. 2012 in Recife, Brazil, and then in Ontario, Canada in 2017. See DOTAC’s website for more information. 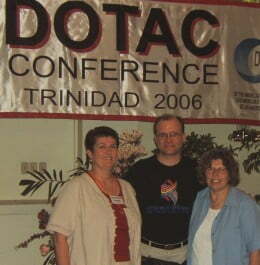 Sharilynn Upsdell, Russell Mitchell Walker, and Linda Ervin representing DUCC at a DOTAC meeting in Trinidad, 2006.